Back in April last year, I popped off to my very first trade show, the Natural Organic Products Europe (NOPE) exhibition at Olympia to have a look at what brands and products were out there for Sophia’s Choice Online Shop. I had a fabulous day and was overwhelmed by the sheer volume of companies all there promoting their wares to the passing public. I made a list beforehand of who I wanted to have chat to and one of them was Childs Farm. They were a brand I’d not heard of on my natural free-from journey thus far and I was intrigued. I’d had a brief look at their website and was struck by how fun both they and their products appeared. When I arrived at their stand I was greeted by an array of fabulously colourful bottles with fun horses, pirates and farm escapades slapped all over them. I loved them. And so would my girls I thought. I started chatting to both their founder Joanna Jensen and her assistant Olivia Sims and was struck by just how lovely they both were. Joanna is a passionate and shrewd business woman. She believes strongly in her brand and has managed to make her organic, natural bodycare for children affordable to all. I applaud that. All too often natural and organic products can end up becoming an expensive luxury for many and out of financial reach for most of us. We don’t all have a huge disposable income to spend each month so coming across an organic range of children’s bodycare products that are affordable to all is in my opinion a great find. Joanna’s initial impertus for starting the company was not being able to find natural or organic products that could deal with her girl’s fine hair. She therefore set out to make a range of toiletries that were fun and appealing to children and their parents from the outside but that were filled on the inside with ingredients that parents could trust and as Childs Farm put it, “combs could cope with!” And with the help of children’s illustrator Emma McCall and their respected manufacturer Medichem International, Childs Farm was born. In case you are interested Childs Farm is named after Joanna's beautiful home and small holding in rural Hampshire, so if you were thinking that an apostrophe is missing in their name, it’s not. After having a long chat with Joanna I took some samples away with me with further information making a mental note that I was keen to stock them if they passed the test of my girl’s hair. The range has a shampoo, conditioner, hair and body wash and two bubble baths; one for the boys and one for the girls. You can obviously mix and match as you wish but I love the fact that they have an array of colourful bottles which will appeal to girls and boys alike. The range is predominantly aimed at children of 3-10 years of age. Their products are free from parabens, SLS’, mineral oils and artificial colours. Their hair and body wash and bubble bath do have “parfum” but this is naturally derived, synthetically made. Their products are not tested on animals. 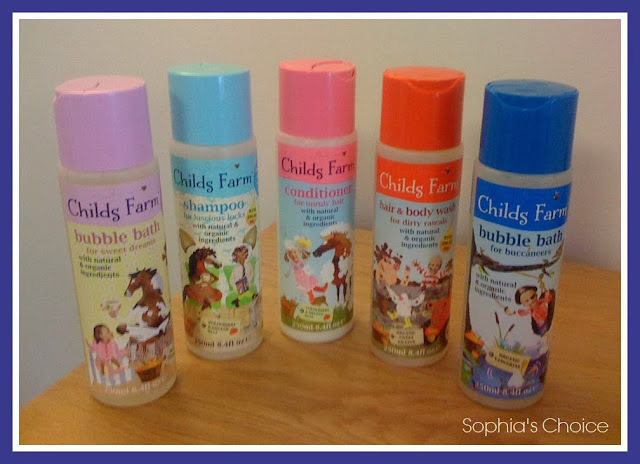 Their products smell fabulous; strawberry and organic mint, zesty tangerine and sweet orange all feature and I now use their shampoo and conditioner on the girls constantly. It makes hair wash night a joy. No more protests, just clean, lovely smelling hair which really is comb-able. And I have to say that I’ve used the shampoo and conditioner on my own hair too and it really is great. Their bubble bath lathers gently and you can even use their hair and body wash as a bubble bath too if you wish. Their full size bottles are £4.69 each for a 250ml bottle so exceptionally reasonable. 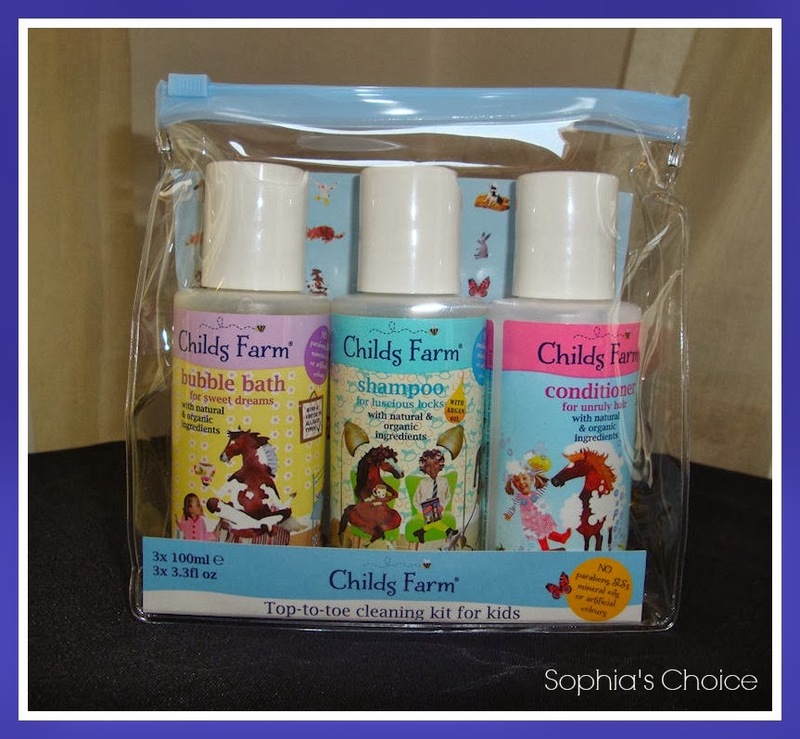 They also do an array of gift sets one of which is a Top to Toe Cleaning Kit for Kids (at £9.35) which has 3 smaller 100ml bottles of the shampoo, conditioner and bubble bath so if you wanted to try before you buy this is a great option. Also, good for swim kits too. They have recently introduced some hair brushes and also a 100ml body lotion to the range too. And if all this wasn’t enough reason for you to buy their range then maybe the fact that 10% of profits from their range go to the Riding for the Disabled which is a charity they are very passionate about and have helped out a lot may persuade you. 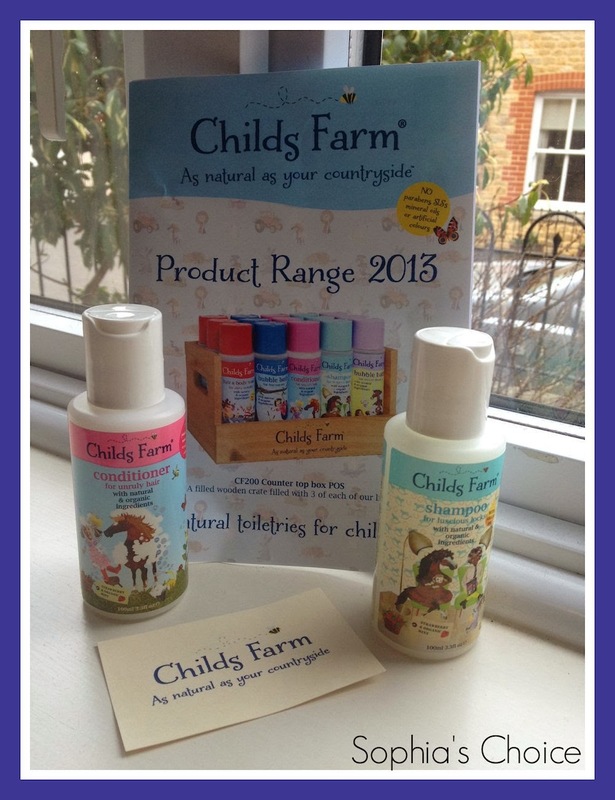 If you’d like to find out more about Childs Farm and their products then they have a fun website with an activities section for kids. They are also on Facebook and you can follow them on Twitter. As well as finding all their product range on their own website, Sophia’s Choice also proudly stock a selection of their range. I LOVE child's farm! It's what I've used on my daughter's hair since July last year and it's my fall back shampoo if I don't get on with whatever natural one I'm trying out! They're reasonably priced as well considering they use organic and natural ingredients.